There is no need to reiterate all that has been said about the benefits that music brings to society. Apart from its obvious functions — in worship, tradition, creativity, entertainment or any given by-product that translates into human development — music and music making works as a vehicle to achieve something else, beyond music itself. Music is also a social tool, a trigger and a platform for many non-musical discoveries and transformations; it has the power to achieve palpable objectives in many aspects of life, be they health, rehabilitation, educational curricula or community engagement. Because of music’s peculiar operational force, and to assure the durability of its effects, music likes to take its time. Music is not a magic show with breathtaking tricks and transformations taking place right in front of the viewers’ eyes; it is not a supermarket stand luring consumers with products ready for immediate consumption. But since in the world we live, time is money, those who believe in music as a tool for change find it difficult to challenge the consumerist mindset. Luckily, there are still those who have not given up the belief that music is a golden vehicle for social, educational and creative change. There are many stories from different countries where cultural institutions and individuals use music as a tool of human communication on all levels. Their stories of success are the cherry on the top of detailed reports listing a wide range of creative activities, procedures, studies, planning, diplomacy and experimental bravery. During my last trip to the UK, I had the opportunity to explore this rich territory that provides countless stories of how whole communities are being addressed and redressed through music. Concerts for children and meetings with managers actively involved in outreach practices allowed me to look into ideas and procedures carried out in the UK. Though a few days only gave me a glimpse, it was enough to see how highly music is valued and how many institutions and orchestras use its force to create a better life for a community, whether it is of children, elderly, underprivileged or ill people, or prison inmates. In this context, this article aims to share some observations along two interconnected lines: on the one hand, how music education helps shape young listeners’ minds; and, on the other, how music can be a tool to help the community to reconnect and help people to regain strength or hope. Investment in children as the youngest participants in the music world is among the principal focus points in the practices of British music institutions. 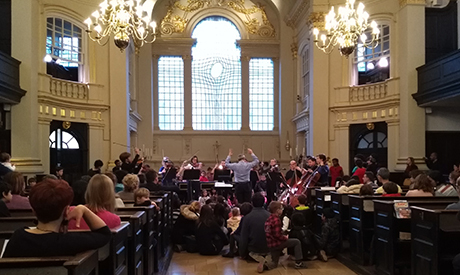 Since my stay in the UK coincided with the school holidays, I had an opportunity to attend two concerts tailored to the youngest listeners: the Mini Maestro Family Concert held by the London Musical Arts Orchestra at St Martin-in-the-Fields, an English Anglican church (on 18 February), and the Family Picture Book Concert featuring Max the Brave, presented by the Britten Sinfonia at the Barbican Hall (on 19 February). In the Mini Maestro Family Concert, conductor and presenter John Landor walked the children through fragments of Mozart’s Eine Kleine Nachtmusik, pointing out the themes, talking about the instruments and even inviting the young attendees to replace him in leading the ensemble. The orchestra emphasised following the young conductor’s movements and tempo, allowing him to feel and understand how his presence has an immediate effect on them. The Family Picture Book Concert was a one-hour performance that combined orchestra, narrator and Ed Vere, author of children’s book Max the Brave who made live illustrations projected on the screen. 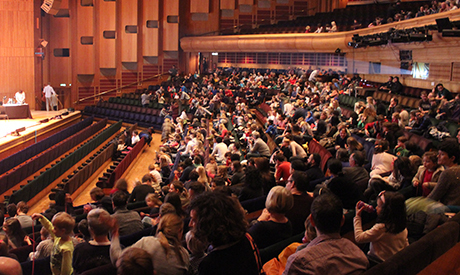 The music and visual component, topped with engaging story-telling to music by Ligeti, Martinu, Mussorgsky as well as Gareth Farr, a contemporary composer from New Zealand, captured the attention of several hundred children gathered at the Barbican Hall. While some compositions were far from what young children usually like to listen to, it was the whole setting and unique energy that kept them interested and responsive. No wonder, once the concert ended, the children queued in the Barbican Hall’s bookshop to get their copies of Max the Brave with the author’s own personalized signature. Whether it was a church or one of Europe’s best known arts centres, the space managed to adapt itself to the children’s expectations. At both venues there was a commotion and frequent conversations among the attendees… Yet, there were no sharp disciplinary instructions coming from the performers, ushers or parents. In Max the Brave, the artists regained the listeners’ attention with a twist in the drawing, music or storytelling. Instead of imposing controlled behaviour, the Mini Maestro Family Concert made the most of the reinforcement of positive behaviour, motivation, never missing an opportunity to praise the child. All those methods were reinforced by unconditional patience, dedication, consistency and a lot of creativity. Positive psychology is an obvious practice I noticed in institutions working in music education, such as the London Music Masters, a charity providing music lessons to primary schools. As I entered a small room at one such school, I saw a group of violinists aged six and seven following the tutor in the arrangement of Twinkle Twinkle Little Star. I noticed one boy lying on the mat, refusing to join the practice, yet the tutor continued with rest of the group. A few minutes later he praised one girl for her beautiful posture, then another girl, then one more violinist… The boy was alerted to the success of his peers. Still somehow giving the impression of total disinterest, he got on his feet and showed how he too could project perfect posture. The tutor didn’t wait to applaud his effort. And the lesson continued. But this pattern should not mislead us into thinking that children lack the necessary discipline that ensures the correct musical output. Next year, the LMM will celebrate its tenth anniversary. In almost one decade, the charity has taken on 1,400 children and expanded its activities to three London boroughs. The curriculum is a creative mix between Suzuki, Kodály and other teaching methods. The LMM offers a separate programme, Pathways, for the most advanced students. 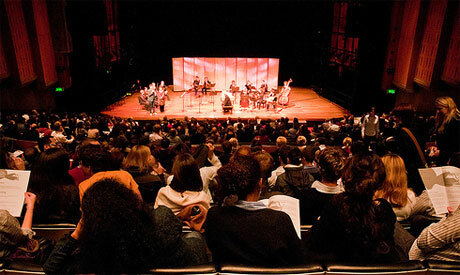 Pathways addresses unique talents within minorities, children from lower income households or from an ethnicity which is underrepresented in classical music. “In Pathways, children go through a very thorough selection process because they have to be willing to put in quite a lot of practice every week and their parents have to be quite committed as well. The programme enables the children to pursue a professional path in the future, but they are not forced to do so,” Roz De Vile reveals, adding that so far nine children have graduated from the Pathways and all of them are now at junior conservatories in London. The LMM’s support of the young talents does not end when the children finish primary school. “We are now putting in place an alumni programme and a support programme so that we can keep them with us in a way. We’ll lend them an instrument for free or bring them back to do some work with our current children and make them feel valued in what they are doing. We can also help with scholarships,” De Vile adds. London Music Masters is one of many initiatives making up for deficiencies in the capital’s music education. 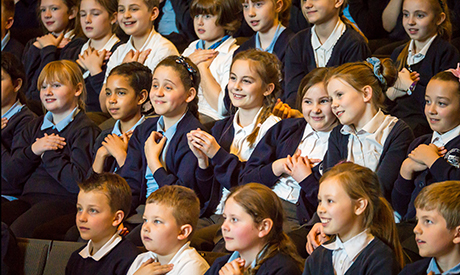 Apart from institutions working on infusing communities with music and music education, London’s orchestras themselves also have dynamic outreach programmes. When I visited London in 2010, I had an opportunity to meet the outreach team from the Orchestra of the Age of Enlightenment, an ensemble that has Sir Simon Rattle as one of its principal supporters and conductors. I was introduced to their Night Shifts, a concert series attracting a new and growing audience, reaching out to young people, particularly those who have very low or no interest in classical music. The Night Shifts are more relaxed and have an educational element, while presenting it — often braided with other music genres — in new venues, pubs and clubs, where the listeners are dressed informally and enjoying drinks. While the Orchestra of the Age of Enlightenment continues its versatile outreach programming, this time I had an opportunity to meet Ruth Currie, the Head of Community and Education at the Resound department of the Royal Philharmonic Orchestra (RPO). The orchestra has an original structure: it is self-employed and consists of freelance musicians. “The orchestra governs through a board of six musicians who manage the artistic direction and future plans, and they employ the administration,” Currie explains. The RPO Resound department builds programs of outreach around the orchestra’s regular concerts. In other words, the Resound uses its own members to address the community and music in different settings such as schools or hospitals. “We work a lot outside of London, especially on the east coast of England and up in Yorkshire. Around 70 percent of the orchestra’s musicians are actively involved in our department’s work. Of course, they do it for an additional fee, but they also value the community work, and the diversity. Musicians find in RPO Resound an important social motivation,” Currie stresses, pointing out the win-win situation. The department reaches out to children and young people, tries to discover new talents and help them to develop and work with the RPO’s musicians in small groups. Another big portion of the RPO Resound department’s target groups are those living in the areas that are culturally under-served, economically disadvantaged or people suffering a variety of health conditions. Currie enumerates many gains and palpable change that the department has achieved in those communities over the past years. This however does not come easily as the department is under constant pressure to find donors. This scope of the work reminds me of the Snape Maltings company’s Learning and Inclusion department (Suffolk, East Britain). In existence for about 20 years, the department is deeply engrained within Snape Maltings’ — and Benjamin Britten’s — concept of how music can serve the community. Not only does it use music activities to address school-age children, from mainstream education to those who are in need of special programmes, it also reaches out to care homes and centres housing elderly people or people with a variety of illnesses, such as dementia. One of the programmes invites dementia patients and their families to enjoy the musical setting together, encouraging mutual involvement, in the belief that this way the families can recover a connection with the otherwise disconnected loved one. 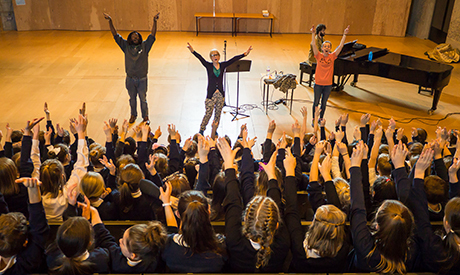 Another programme called Participate offers monthly sessions held on the Snape Maltings’ campus, where it invites the community to escape from their lonely lives and spend time together with music and workshops. It is obvious that wherever one goes, one finds music managers exerting a lot of effort to reach out to the community or bring music education to the lives of children and the young. 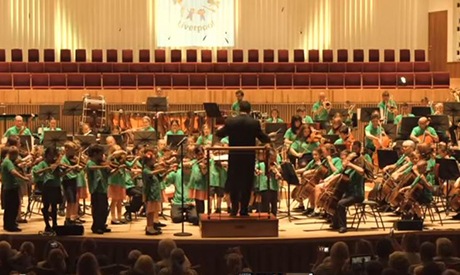 It seems natural that in a city like Liverpool, World Capital of Pop, birthplace of the Beatles, cradle of the Beat Music movement and home to the Royal Liverpool Philharmonic Orchestra, the UK’s oldest still active symphonic orchestra, music plays an important role in the community. The programme compares its activities to those of the Venezuelan El Sistema, though the roots of the latter were born in Social Action for Music and targeted children from the most impoverished margins of the society and school drop-outs. Even if the social and economic situation of 1970s Venezuela and today’s Liverpool are very different, this does not take away from the importance of In Harmony in improving children’s lives. “Within Liverpool, the Everton Ward is one of the most socially disadvantaged areas. That is the reason we set up the programme in this area. The situation is different from that in Venezuela because here, most children are enrolled in schools regardless of their background. Here, despite the physical reality in which they live being more favourable than in Venezuela, they face social challenges within their community and so we try to help them achieve their best potential,” Skipp explains. He concludes by listing the many advantages of the programme where the children have two instrumental lessons and an orchestral session each week, once again with a little bit of Suzuki, Kodály and others. Skipp’s words echo Ruth Currie from RPO as she expresses her belief in the many gains that UK institutions and orchestras provide for children and the community at large. Currie calls it “a journey that breaks down many barriers”. Such a practice also erases the fear associated with the “classical music” in particular. Currie’s statement might ring a particularly resonant bell with those readers who tend to look at classical music as a by-product of the Western culture and hence embraced by their communities. This is where the music educators and outreach programmes have their hands full, taking the different segments of the society on a journey through music. Most importantly, while the strategies implemented by UK practitioners do prove effective, they do not have to be limited to a specific classical music genre. The strategies are equally adaptable to all music and even other art forms. More important than the genre is the belief that music can make huge transformations; it can improve lives and bring social, psychological and even health improvements to its practitioners and listeners. Each cultural player – any investor, any donor, regardless his geographical or cultural belonging – can either implement or support the outreach strategies which can improve lives. The key is in will and perseverance, as results will take time to show.